Santa Rita is championing Chilean Petite Sirah with the addition of a new “icon” wine to its range. Launching with the 2010 vintage, Bougainville is a blend of 85% Petite Sirah (also known as Durif) from the Alto Jahuel region of Maipo and 15% Syrah from Limari. With 41 hectares of Petite Sirah, Santa Rita accounts for around 22% of Chile’s total plantings of the grape variety, which it has also planted in other parts of Maipo, as well as Colchagua. 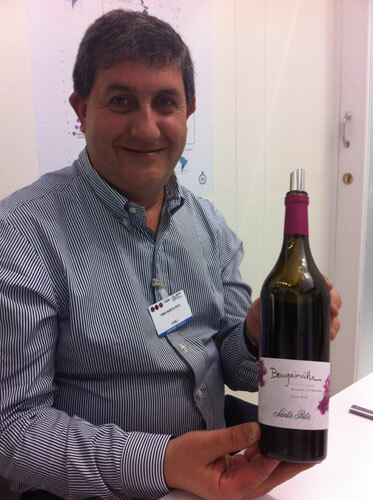 Speaking to the drinks business, the producer’s technical director for wine, Andrés Ilabaca, admitted that the company had originally intended to buy Syrah. However, he praised the results now being achieved with Petite Sirah, particularly in Alto Jahuel, while highlighting the benefits of training it on high pergola systems. As for the decision to add Syrah to the final blend, Ilabaca told db that Petite Sirah can be “a bit flat” on its own, but “Syrah gives it a sweet intensity.” In order to enhance this characteristic, the wine is matured in 100% new French oak for 15 months. Turning to the name Bougainville, Ilabaca pointed out not only that the distinctive pink bougainvillea plant grows widely at the producer’s Casa Real Hotel, but that in many parts of South America the plant itself is known as Santa Rita. Bougainville is expected to arrive in the marketplace later this year. Although the final price is yet to be confirmed, Ilabaca suggested it would be “around £50-60” in the UK. Meanwhile Ilabaca also revealed that Santa Rita is currently working on a new range based on Cabernet Franc from Pumanque, a sub-region of Colchagua, which is due for release in 2014.